Statesville, North Carolina (September 10, 2018) – The Super Cup Stock Car Series will make its third and final trek of 2018 into the Laurel Highlands for Saturday’s highly-anticipated championship night. Jennerstown Speedway Complex will feature the crowning of their five local division champions as well as a rescheduled visit for the lightning fast Must See Sprints joining the full-bodied touring stock cars for a jam-packed and unique day of racing. The American Racer Night at the Races presented by Performance Fiberglass Products portion of the program will feature Twin 50-lap features with each playing a pivotal part toward all that the year so far has led up to. Among those who have announced their intentions to compete on Saturday, a quartet of closely matched Pennsylvania drivers will settle the Northern Division title by the conclusion of the first Twin 50. Kevin Kromer has seen his share of setbacks with the No. 77 Lehigh Valley Cancer Institute / Mission R.A.C.E.R. / Warren Pallet / K2 Motorsports Chevrolet a victim in multiple incidents throughout the year. Nevertheless, the Walnutport driver has displayed a history of consistency which could see him as the favorite going in. 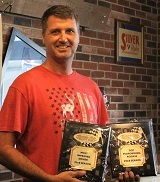 Kromer holds the series record for most consecutive top 10 finishes, which was set over a three year span. Bill Ashton knows how to win at his home track. The Uniontown driver will look to bounce back from mechanical issues last time out and replicate his winning performance from two years ago in the No. 35 Budget Blinds of Altoona & State College / Ashton Racing Chevrolet. Pittsburgh’s Jeff Zillweger and Littlestown’s Jason Schue have never won a SCSCS race, but have remained in the hunt by staying out of trouble and grabbing their best career efforts at Jennerstown in the past. A victory for any of these four will almost certainly seal the deal for North champion honors. 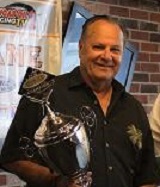 The overall SCSCS championship has been in command this year by Bob Schacht from the beginning. Despite a series-leading five victories, misfortune in recent events has kept the Mooresville, North Carolina resident from locking up the title though. 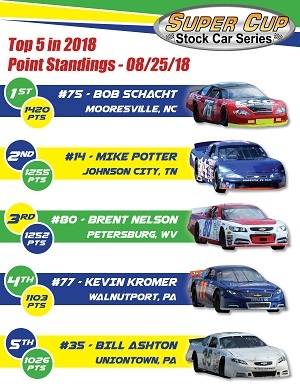 Based on the number of entries currently expected, Schacht could potentially clinch his first SCSCS trophy with a finish of 12th or better in the first Twin 50. Both Twin 50 races will count toward the final tally. Additionally, the No. 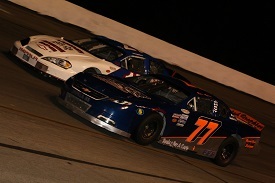 75 Engineered Components / Bob Schacht Motorsports Chevrolet could possibly set new single-season records if another Pole Award and a sweep of the evening’s races were to occur. Mike Potter and Brent Nelson remain with a mathematical shot at what would be their first championship as well. Potter has been the mark of stability in 2018, completing the most laps of any competitor and being the only one that has not finished outside the top 10 all season long. 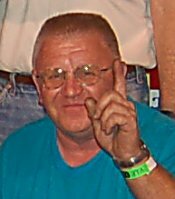 The Johnson City, Tennessee longtime racer’s best career SCSCS finishes, a second and third, came at Jennerstown back in July. Nelson comes into September with the most momentum, having swept the Twin 50s most recently held at the 1/2-mile complex. The No. 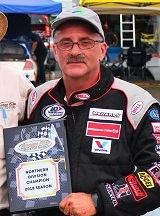 80 Royal Purple / Airtek Inc. / Steam Turbine Services / Precision Auto Collision / Atkinson Welding Chevrolet has inched within three points behind Potter with his sights set on nothing else but another pair of wins. The Petersburg, West Virginia driver also has the potential to set some all-time series records. 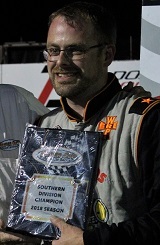 He recently surpassed Kromer for the record of consecutive SCSCS starts and is on the cusp of being the leader in a few other categories such as most top five finishes, most races led, and most times qualifying within the top six redraw. While the highest two achievements to be decided over the weekend may be out of reach, several competitors will have a variety of their own specific goals. The CR7 Motorsports two car team makes their initial Jennerstown appearance of 2018 and has seen their share of past success with Codie Rohrbaugh behind the wheel. On Saturday it will be Rohrbaugh’s Grandfather, Larry Berg, driving the No. 7 Grant County Mulch Inc. / CR7 Motorsports Chevrolet in an effort to put the West Virginia based group back in victory lane. They have not gone winless in a season since Rohrbaugh’s rookie year in 2013. Berg’s teammate Stephen Cox needs a solid result aboard the No. 21 STA-BIL 360 Performance / Impact Race Products / CR7 Motorsports Chevrolet in the first Twin 50 in order to maintain eligibility for the Southern Division title taking place at the end of the month at Dominion Raceway. It was implemented over the off-season where if a driver misses an event in their ‘home’ division, they could substitute points missed from another race in one of the other division’s races. Mocksville, North Carolina’s Marc Jones already took advantage of this new rule earlier in the season. Jones has his sights set on a couple special awards, not to mention continuing the trend of his recently improving finishes. The best career fifth place finisher last time out has been the top performing rookie competitor most of the season and also has a one race lead for the season-ending Hard Charger award, given each race to the driver who moves up the most positions from green to checkered flag. North Carolina’s Ben Ebeling, a two-time winner at Kingsport Speedway in 2018, and Texas driver Toby Grynewicz, who has led 13 laps with three top five finishes at Jennerstown, can peek their way into the top 10 in the final standings. Each of these points finishers as well as special award recipients will be invited to attend the regular season concluding trophy presentation the Sunday morning following the races in Somerset, Pennsylvania. Due to partial year schedules, others simply have nothing to lose and will be focused on earning their first victory or bettering prior performances. Long Island native Ron Langdon returns after taking the month of August and will be poised to contend for the win. Former Jennerstown track champion Andrew Kostelnik now has a trio of third place finishes in only four starts and will be looking ahead at the coveted checkered flag in front of his home state fans. Meanwhile, a pair of additional past track regulars, John Komarinski and Lauren Butler, have shown they can get the job done with top five finishes early in their SCSCS career. Twin teenage brothers, Landon and Hayden Brothers, both accomplished their first ever top 10 finishes and continue in their search for speed and experience. 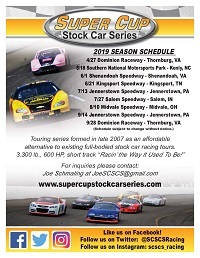 The Sopwith Motorsports Television Productions crew will be on hand to film and produce all the action leading up to the crowning of two Super Cup Stock Car Series champions for premiere on MAVTV. Details regarding dates and times for these nationally televised broadcasts will be announced in the near future. With a busy agenda scheduled for Saturday, first SCSCS practice is slated to begin promptly at Noon with qualifying taking place shortly after 3:00 p.m. The first of the American Racer Night at the Races presented by Performance Fiberglass Products Twin 50 will be ready to go at 6:00 p.m. A Meet and Greet with the drivers will be part of the festivities in between races behind the Jennerstown Speedway grandstands. An optional open practice session will be offered to teams on Friday night from 6:00 to 10:00 p.m. as well. 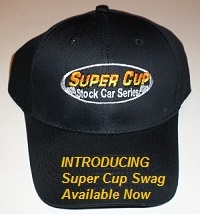 As a bonus for fans, the Super Cup Stock Car Series is offering an experience in which one randomly selected winner (and optional guest) will get to spend the day in the pits and receive an in-depth look at what takes place on a given race day with driver Toby Grynewicz and team. Details can be found at www.facebook.com/SCSCSRacing.